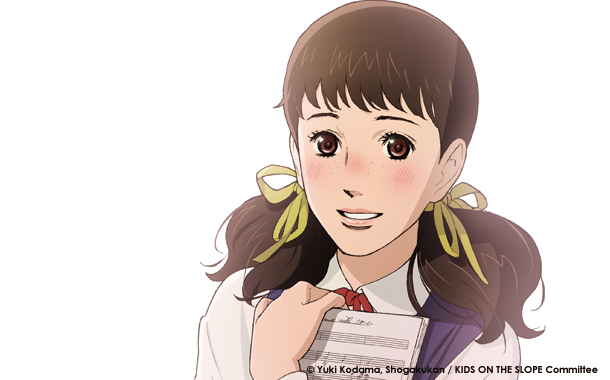 Kids on the Slope is a coming of age drama story about a high school student named Kaoru Nishimi who moves into a small town and is a very miserable person. During his first day at school he suffers a panic attack and dashes off to the school's roof. Kaoru bumps into another student by the name of Sentaro Kawabuchi on his way there and finds out he was skipping class to catch up on some sleep. 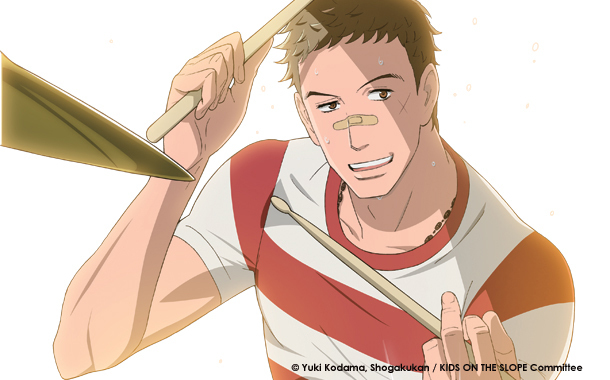 A group of school bullies turn up to kick Kaoru's teeth in due to an incident from earlier in the day. Lucky for him Sentaro steps in and whoops the gang of bullies and helps Kaoru get to the rooftop so he can relax. After the brawl Sentaro jokingly charges Kaoru for his services and gives him the nickname "Ritchie Rich" due to being fairly wealthy. 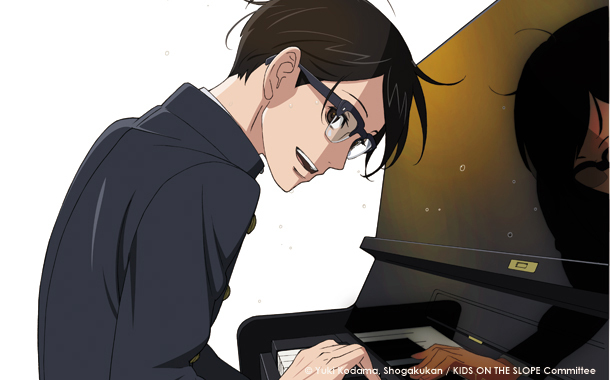 Later that day Ritchie (is what he is known as for the rest of the series) drops by at the local record store he runs into Ritsuko Mukae (a girl he befriended during his first day of school) invites him to come into her basement to hang out with her and Sentaro. Sentaro despises this idea at first but things soon change when they find that they have a thing in common and that is that they both know how to play a certain jazz song and from that we see the trios friendship grow very quickly and they form a band with Ritchie on the piano and Sentaro on the drums. That's only the tip of the iceberg as you will also see romance, drama, school life, and some smooth jazz music. (Click "Read More" to see the rest of the article). 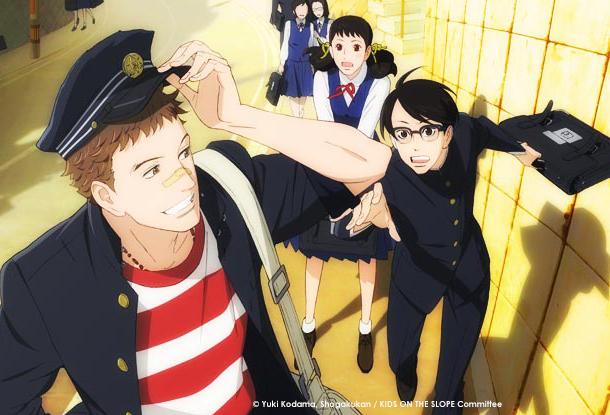 The story of Kids on the Slope has a very strong essence of classic American coming of age films like "Steel Magnolias (1989)" and "The Breakfast Club (1987) mixed in with some Studio Ghibli inspired visuals with the mixture of the two making it a very charming show to watch. My first impressions of this show was that this was going to be a show about a serial killer similar to that of "Dexter" due to the character "Ritchie" being very creepy. Once the show kicks in towards the end of the first episode you will be greeted with a wonderful cast of characters that will charm you and will also attach to your emotional senses so you will laugh when they laugh, cry when they cry, and overall have a good time with them. Even though the shows only run at around twenty minutes (excluding credit sequences) you do get quite a filling experience with no scenes that feel dull, boring, or wasted with filler. This show also feels like one very long movie rather than a television series. Artwork and animation are both very top notch with beautifully drawn characters, very detailed backgrounds and really impressive animations in the band sessions scenes where they put in a ton of effort matching up the animations and the music in perfect synchronicity. The English dub is decent but it can feel pretty stiff at times but nothing so bad that it will make you stuff your ears with cotton buds soaked in alcohol. Oh man the soundtrack to this show is absolutely brilliant with some very awesome covers of legendary jazz tunes by "Miles Davis", "Bill Evans", "Art Blakey", and even some tunes from the classic film "The Sound of Music (1965)". If you are a fan of behind the scenes information you will be very pleased with the special features as you will be greeted with interviews that will tell you everything you need to know about what inspired the series, what it was like working on the series, and some amazing footage of how they did the band jamming scenes. 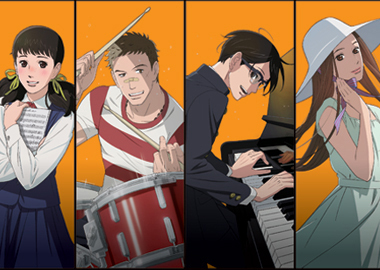 The people that are interviewed are Shinichiro Watanabe (director of the show), Takashi Matsunaga and Shun Ishikawa (the pianist and drummer that performed the music in the show), and Yoko Kanno (music director of the show). They are quite lengthy too and will add another hour to your viewing time but be warned as these special features are subtitled only. There are also some television promotions that aired in Japan which is very nice to have included in this set plus the typical text-less opening and closing credit sequences that are also very welcomed. 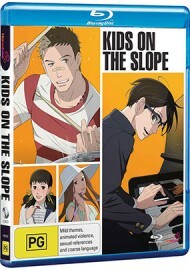 Overall if you are a fan of coming of age dramas you will really get a kick out of this series. If you are not a fan of this kind of stuff I do recommend you give this series a chance as I'm certain you will enjoy this show. Really great show. Beastcast 41 - Let's Chat with Michael again!